There are all different types of pets, so I’ll start off by using burning angel as an exaple. This type of pet is the magic attack type, thus its MATK determines its attack power. So how is MATK determined? a) If the intelligence aptitude doesn’t change and intellect increases by 1, then MATK will increase by 2.7.
b) If intellect doesn’t change, but the intellect aptitude increases by 70 points, then MATK will increase by 1. 2. Intellect is determined by level and number of assigned points. So, it is clear that maturity and level determine the attack strength for this type of pet. 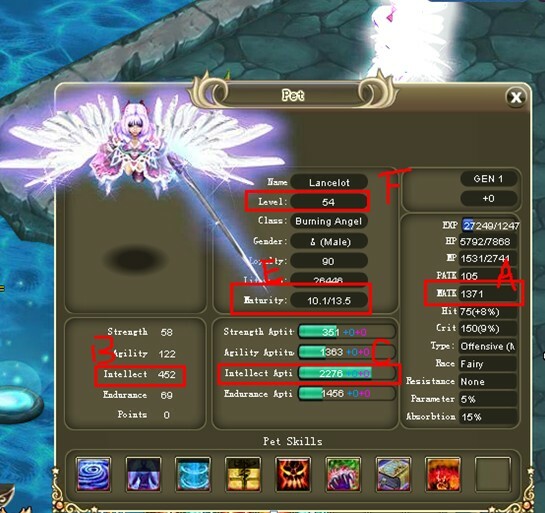 Each time your pet levels it has a random chance of obtaining a skill, it is best to retain any aoe skills. I’ll post most about the different skills in the coming days.